Homes Needed for Deserving Cats! The best solution for feral cats is to spay / neuter them, vaccinate them and then return them to their original location where they will be fed and monitored under the watchful eye of a caregiver. Sometimes, however, it is not feasible to return them to the environment from which they came. This occurs when there is no caregiver, the environment is dangerous, or the neighbors do not want the cats around. Usually, these cats are not socialized and are not adoptable. Sometimes even cats that are tame and socialized to people may not be adoptable because they have a behavioral problem. What can be done for these cats? We can offer them a new, safe, life as a barn cat! 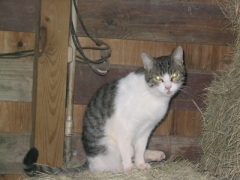 A "barn cat" is any cat that is deemed to be not adoptable as an indoor pet. Most often the cats are feral, which means they were born and raised "in the wild" with little or no human contact. Others are hard strays, cats that were once domestic but reverted to unsocialized behavior after long periods of surviving outdoors on their own. Still others are indoor/outdoor cats that may be friendly but have issues using a litter box due to medical conditions or other problems, or they may continue to spray inside even after neutering. In addition to placing tame cats and kittens, cat rescue organizations (hereinafter referred to as "agencies") occasionally need to find homes for feral and unsocialized cats that cannot live as house pets and cannot be returned to the area from where they were rescued. Removal of feral cats is paramount when structures have been demolished in deserted areas, preventing the cats from reaching any safe shelter and exposing them to predators and weather that would weaken their health and/or cause their death. The cats are healthy, sterilized, and desperately need new outdoor homes. Also, tame cats with behavioral issues can be placed as barn cats when they may be at risk for being euthanized because they are not considered adoptable. This program was established to place feral cats from colonies that would otherwise starve or be euthanized. Our barn cat program reaches out to people with a working barn or safe, heated outbuilding. In taking in barn cats, you are providing a wonderful and generous gift to these animals that need a safe and warm place to live out their lives. Barn cats will earn their "keep" by suppressing rodent and snake populations and keep them out of your buildings and barns. The cats will help control rodents in grain and storage areas. This prevents rodents from destroying structures and protecting feed and grain supplies. 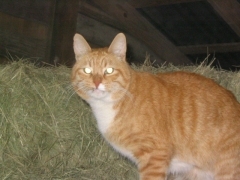 The barn cats will help the property owner, while the property owner provides the cats with a safe place to live. The cats can also provide companionship for horses and other livestock. A feral mom cat gives birth in someone's yard or under a deck. The kittens are socialized and placed in permanent homes. What about the mom? A feral cat shows up at an apartment complex. The management wants the cat removed. Where should the cat be taken? A trailer park is scheduled to be demolished for development. The homes where the feral cats lived will soon be demolished and they will perish in the construction. Where should they go? Neighborhood kids are trapping cats as bait for dog fights. No one reports the incidents as animal cruelty because "it's just a cat." Should living creatures be treated in this manner? Please help us provide safe and much-needed homes for these special cats so they can continue to live out their lives! If you own property or have permission for long-term placement and would like to learn more about this program, please contact us at 210-232-2790 or 210-378-9036 or send us an email. We are currently limited in the area we can cover to approximately 100 miles from the San Antonio metropolitan area due to our small network of participating agencies. We hope to expand our coverage in the future as more agencies join our network.